One of the jobs I worked on today was a perfect example of how the quality of your work shows in attention to detail. 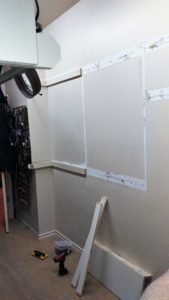 My customer had all of her closet racks pull loose from the wall and basically dump themselves in the floor. The reason why? They had only been nailed up to begin with. Any added weight would gradually begin to pull the racks loose until they collapsed. 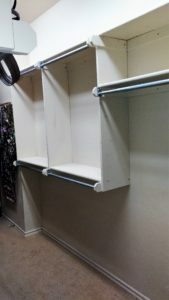 I rebuilt and then reattached the shelving with nails and screws to hold up under the added weight of apparel. End result…secure racks and a happy customer!!! Nailed it…and it all came tumbling down! Screw this…instead, to support the weight of apparel added to the racks.